The band are working with promoters to reschedule the shows, amid reports that Jagger will have heart surgery later this week. "I really hate letting you down like this," tweeted the star after the tour was postponed at the weekend. "I will be working very hard to be back on stage as soon as I can." The 75-year-old is expected to make a full recovery and return to touring this summer. "We're beginning to look at the rescheduling options and we're going to try and do this as quickly as we can," said John Meglen, of the Stones' promoters Concerts West. "Everyone's health and happiness comes first," he told Billboard, adding that new dates could be announced "in the next couple of weeks." The US leg of the band's No Filter tour was expected to kick off in Miami's Hard Rock Stadium on 20 April; wrapping up two months later in Ontario, Canada. 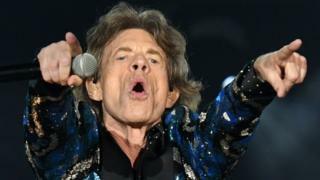 Fellow Stone Keith Richards tweeted following the postponement, "A big disappointment for everyone but things need to be taken care of and we will see you soon. Mick, we are always there for you!" Band-mate Ronnie Wood added, "We'll miss you over the next few weeks, but we're looking forward to seeing you all again very soon. Here's to Mick - thanks for your supportive messages. It means so much to us." Although the main shows will all be rescheduled, the band's headline performance at the New Orleans Jazz Festival has been cancelled, with organisers currently seeking a replacement.